Home / Columnists/ Hitler in Sri Lanka! Usually the subject matter of a sermon, particularly if delivered at a domestic setting, is unlikely to catch the interest of the larger public. These are practices of the faith, private functions for the householder, his family and invitees. It is the custom, particularly among the well-to-do Buddhists, to mark a personal milestone, like a birthday, with an almsgiving for the clergy followed by a sermon. After the departure of the monks, the gathering will be served a meal. There are professional organisers for such events, relieving the organisational burdens from the householder, provided he can afford the exercise. This household was somewhat unusual in the sense that Gotabaya Rajapaksa, the householder, brother of the former President, although avowedly no politician and purportedly with no political organisation behind him, is widely considered a potential presidential candidate, to some even a certain winner at the next elections. In an age when the bloodline is irrelevant for high office, when we all claim to be enlightened republicans, an appreciation of the South Asian ‘political mind’ is essential to understand this strange political phenomenon. In this part of the world, political vision and ability runs in the family; all for one, one for all! To hold sway, this South Asian inclination towards family based politics, feeds on other social and psychological ingredients. Large numbers who can be described without offence from the public stage as “Dugi Duppath” (poor and helpless), habitual seeking of patronage and the waiting for handouts mentality are essential for the so called prominent families to predominate. When the vote was first introduced in early 20th century, the populace, unsure and uncomfortable in their new role, looked at powerful personalities in the area for guidance and leadership, inevitably turning electorates into family bequests. This family hegemony found legitimacy from many sources, including the top of the political leadership in the form of the Senanayakes and the Bandaranaikes who needed no encouragement to endorse family as a desirable political method. Even at the other end of the political spectrum, those professing Marxism here; the anti-thesis of the feudal mind, denouncing the rotten system from every platform have also proved their “good family values”. Philip Gunawardena is said to be the father of Marxism in this country and founder of the political party, the MEP. His son Dinesh, now leads the party, perhaps there is a grandson waiting in the wings to “lead” the rump MEP. To his credit, bloodline is not the only thing Gotabaya Rajapaksa can claim. He was one of the few who thought that the LTTE should be and could be defeated and with the wholehearted blessings of his President brother Mahinda, became the administrative lynchpin of the campaign against the terrorist group. The effort bore fruit. For sure, the psychology of family hegemony was the decisive factor in his effectiveness; no other individual would have had the license and the indulgence of the powers that be to that extent. For the family mindset, that filial connection is open sesame, invalidating or diminishing all else. None before empowered the family as grossly as Mahinda Rajapaksa. During his tenure as President, brothers, sons, cousins and in-laws all became part of the Sri Lankan Power structure. Sirima Bandaranaike who is said to have nourished a family tree during her tenure as Prime Minster (1970-77), comes a close second, but in that era there were far less financial goings on while an active opposition and a more independent bureaucracy acted as a restrain on excesses. Most of the Sirima Bandaranaike appointees were independently endowed, and perhaps did not view public office as the ‘main chance’, in the manner the desperate ‘relatives’ of today view such appointments. Gotabaya’s career as a high public officer, if it could be described as such, didn’t end with the war. There were more dazzling rewards awaiting him, mainly in the important area of urban development. Funding was available from the World Bank and he got down to work with an independence and power rarely seen in this country. Some of the things accomplished were much needed and even laudable. To give him his dues, in a few years Gotabaya was able to transform the city of Colombo from a dirty, polluted metropolis to a much cleaner and liveable place. A serious attempt was made to discipline and regulate urban living, a drastic attitudinal change being a crying need for Sri Lanka. Applauding Gotabaya does not mean to forfeit our critical faculties, especially in respect of the circumstances and the process of his public life. Projects/enterprises of a public nature are carried out in a larger context of competing social priorities, return on investment and accountability. Should a plush airport be built in your own District based on fanciful speculation or should that money be channelled into technical training for the younger generation? Do public works contracts go on fair tender or channelled to henchmen and relatives, establishing a sickening cronyism? If the overall perception of the Sri Lankan State structure is that of one rife with corruption, nepotism and cronyism, however laudable individual actions within the structure maybe, they remain part of a rotten system. To gain perspective, Kaddafi’s Tripoli and Saddam Hussein’s Baghdad were impressive, well maintained ornaments of those regimes. These capital cities were also managed by a relative or a henchman of the respective ruler with unusual empowerment, and with access to more than adequate funding. However, the grandiosity of these cities didn’t make either Libya or Iraq good countries, or even fast-developing economies. President Mahinda entrusted brother Gotabaya with other projects too, one being the struggling Apollo (Lanka) Hospital. Here is a task calling for other skills, effective application of modern medical methods, while keeping the organisation in the black, with gain for the stakeholders. As he was wont to, it is said that Gotabaya brought in Army officers to the front office. Apparently they were polite and as efficient as their training made them. But was the experiment a success as the core functions of a private hospital go? Are there no limits to family skills? For most of our history, India was the only world we knew. Not that our kings made regular visits across the Palk Straits; what they came to believe of India came mouth to mouth, several times hearsay, vague magical stories about the massive land across the waters. In nearly everything, spiritual as well as corporeal, India was our reference point. The wisest sages, righteous rulers, richest merchants and the prettiest damsels came from India. The world has shrunk incredibly since. We have awareness of many more lands and cultures now. Our legislators pore over laws of other countries, as varied as the UK, South Africa, New Zealand and Hong Kong, referring regularly to unfamiliar ideas; the Latimer principles, Erskine May, conflict of interests, parliamentary decorum. Our doctors do their training in different countries, adopting the latest methods of practice as well as approach. In common conversation there are easy references to Lee Kuan Yew, Donald Trump, Bill Gates, Joseph Goebbels and even Hitler; distant and incredibly far-flung from the references of the days of the kings. That reference to Adolf Hitler by a Buddhist priest at the Gotabaya residence was made in this context; a statement only accountable to a palpably weak grasp of that particular history. The German race is no laughing matter, they are among the best performers in almost every sphere of human endeavour; philosophy, technology, literature, music, sports. For many of our so-called elite, a state-of-the-art German car is confirmation that he has arrived. Even under Hitler, that darkest period of their history, the Germans fought the combined forces of Russia, America, United Kingdom, and France among many others, to a near stand-still. For his aggression against neighbouring nations and the ruthless persecution of Jews and other races, Hitler is considered one of the worst villains of human history. But despite all the dictatorial powers he then commanded, there is no record of Hitler promoting his relatives to high State office. In that priestly urging to Gotabaya, things are made almost painfully simple – be a “hard’ ruler and the country will zoom forward like a rocket. Put in another way, if only there was a tough leader, we would surely be the miracle of Asia! A hardworking capable race awaits in a richly-endowed land for that one leader, denied to them thus far! The ‘Yahapalanaya’ exercise has proved in the most disappointing way, the limitations of the human material we have; only distinguished by their big talk and small deeds. When the nation looked to a promised land, they find themselves in a morass of deceits and swindles, a government preoccupied with retaining power, busying themselves in petty deeds to enrich themselves and their families. 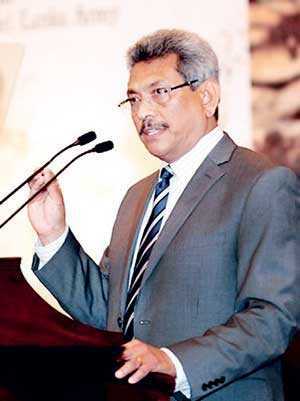 Will Gotabaya be the long-awaited deliverer? Is his life so gentle and the elements so mixed in him that nature might stand up and say to all the world – this was a man? Or will the nation remain true to its recurring theme of mediocrity, proving that people are differently wired, endowed in their own way? And upon facing the reality of inevitable failure, will he unleash his ire on the opposition and the media, accusing them of undermining the regime? Hitler thought that his failure was brought about by fiendish Jewish plots. Sri Lanka is too small a pie for the Jews to conspire against. But it has never been too difficult for our leaders to find a scapegoat.